I am thrilled with the feedback I am getting from so many of you regarding positive changes you are experiencing in your life. It really is incredible how clean eating, regular exercise and meditation can lead to a balanced, peaceful life journey. Personally, I am excited to be revisiting my own meditation journey a little more seriously as the benefits are “off the chain, ” or better than we can imagine! Meditation helps restore balance between the left and right sides of the brain. The left side deals with thinking, speaking, writing…the right side, intuition, imagination and feeling. Our hectic lifestyles find us spending my time using our left side, emitting “beta” waves and spending much time in the past and future. When we allow ourselves to slow down, the brain emits “alpha” waves, allowing us to be much more open to our feelings as we live in the moment, or the present. In that state, everything takes on new meaning. Additionally, clinical studies in to the effects of meditation have shown a reduction in migraines, insomnia, irritable bowel syndrome, panic attacks and lower levels of stress hormones. In the office, studies have shown not only increased work performance, but also increased job satisfaction. Time for me to relieve the left side of my brain and go ignite my right side. I am off to SIT. I’ll be at Bally subbing for Carol today- 11:30 Senior Fitness. 12:30 Yoga. Tonight I’ll be at TFC– 6:00 Cardio combo. 7:00 Yoga/Pilates fusion. Expect some meditation at the end of all of those! I just can’t help but feel if more people would meditate, less people would need to medicate. That’s what I call HEALTH CARE REFORM! When I was about 20 years old, my sister taught me how to meditate. Thank you, Arlene. Like riding a bike, it is something you may or may not use often, but never forget how to do. Though I am far from faithful about my meditation, through the years I have used it like a tool, pulling it out when no other tool would do the trick. Many of my classes end with a minute or two of quiet meditation or the silent practice of gratitude. Lately, however, my body and soul yearn for more. After reading Eat, Pray, Love I was only jealous of Liz’s time India, staying at the Ashram, waking in the wee hours of the morning to just SIT. Interestingly, that was part of her journey that she did not enjoy and managed to find away around it. When I saw the movie recently, my interest in sitting, was reawakened. I have begun to revisit my meditation journey. In my beautiful office, which I use for little else, with its calming colors and fragrances, I am designating part of the space to my meditation practice. Trying for 10 minutes a day, hoping to have days where my sessions will be longer, I am excited at all the benefits that I know I will derive from this. There are many ways to meditate. Focusing on an object in the minds eye, (such as a flame, a heart or a peace sign) repeating a mantra (silently or not) such as OM, or focusing on the breath cycle are some of the more basic methods. Any good class, book or even googling meditation, will help you find many other techniques. 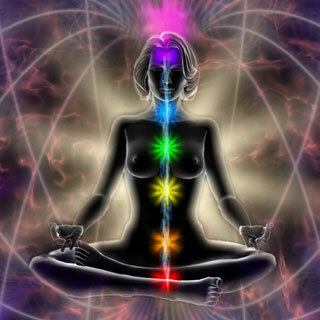 I like to imagine a ray of warm, healing, sunshine radiating UP from the bottom of my spine, to the crown of my head, hence flowing through each of my chakras. At the top of my head, the healing light breaks through and rains down upon my entire being. Regardless of what method you choose (and there are no right or wrongs, here) the idea is always to return to your focus whenever thoughts begin to wander. Many people have a hard time just sitting. This is THE NORM!!! The more you practice, the easier it becomes. Simply find a place that is peaceful for you and where you are able to sit up comfortably. It’s important you keep your spine tall as this helps facilitate much better breathing. Start with just a few minutes a day. The benefits are far too many to list so I’ll be back tomorrow with those. For now, I am off to my sacred spot. Yesterday afternoon Mitch and I watched the original Rocky Movie. I forgot how much I loved it. A great story of how true love and hard work can triumph over ANYTHING and ANYONE! How can the line “Yo Adrianne” still and again, make me cry like a baby? Good job, Sylvester. Earlier this week I also learned that I have finally broken through my running wall a full 11 months after my hamstring injury. It seemed like every time I would try to run, something would stop me. This past week, on election day, I decided to run to my voting poll and back and though it was not a long distance, it was longer than I had been able to go all year. Then Thursday I ran with a client and ran harder, faster and further than I expected. I now know that when swimming weather is behind me, running weather will have arrived. After Jane and I ran, we went back to her house and did yoga. What a perfect combination that made for a great hour’s workout. Thursday morning I took Blaze for a 2 mile walk. It was his longest, since injuring his leg 2 years ago. We usually walk about a mile a day together, sometimes adding in a bit of jogging, but never have gone much past the one mile mark. I just never wanted to push him too far. Thursdays he is the leader, though, and he kept letting me know he wanted to go further. I was so relieved that he walked the distance with no repercussions. I did spend a little time massaging his leg after, and we revisited some bending and stretching exercises that we were doing shortly after his injury. I am ALWAYS amazed at how smart animals are. Its been at least a year since we did those exercises, but he remembered the words and gladly participated. After hearing about a new “calorie burning” drink, (Celcius) from Mitch (via one of his clients) I tried it this week. With just 10 calories in the can, it claims to burn an extra 100 calories if you drink it about 15 minutes before you workout. I made the horrific mistake of drinking it without reading ALL the ingredients. As soon as I tasted it, I knew it had some artificial sweetener, but curious to see if I felt any different. I am not really sure what I was looking for, as how would anyone really know if they burned an extra 100 calories just by how they felt?!?! Anyway, the taste of the sucralose stayed with me the entire day and the caffeine (which I now stay away from in my cofffee) elevated my heart-rate about 20 beats a minute over it’s norm, the entire day. Seriously, 12 hours after I drank it my pulse was still in the 80s. If you are not caffeine sensitive and you still insist on ingesting artificial sweeteners, (I know many of you, do) you can find Celcius most everywhere. In Publix, I found it by the Slim Fast and other weight loss products. Down on the bottom shelf. Gotta look for it. I have 2 cans left as I bought a 4 pack. If you want them, let me know! I wish I could say I found a magic bullet, but there ISN’T one!!!! Lesson relearned. To learn and to teach. I always feel that is MY personal mission in life. I don’t know much, but I do like to share what I learn along my life journey. This week Rocky reminded me to always work my hardest to accomplish what might seem impossible. Time and patience really does heals wounds. Salt DOES put out small kitchen fires. Panic never helps. Wanna increase your metabolism? Drink and extra cup of coffee or two. There are NO magic bullets. Work harder. Don’t settle for less than everything. Savor your accomplishments. You deserve the very best in life. Go get it! **Looking to learn more about Yoga? Please click the first link UNDER articles on homepage and read the newest one on Hatha Yoga. Thanks, Charlene. Namaste. So it’s Saturday morning and you really, really want to go to the gym, or outdoors to workout on a beautiful summer morning, but you worked all week and your house is a mess. Lucky for you, you don’t have to choose between cleaning and working out. VIGOROUS housework not only burns calories and works you muscles, but also keeps you healthy! One study involving 30,000 “normal-weight,” women found that their vigorous exercise which included housework, reduced their risk for breast cancer by 30%, while another study found for every 287 calories burned doing daily activities such as vacuuming and mopping floors, the risk of dying as a result of a fall decreased by 32%. Remember that if you are going to make cleaning your house your fitness workout, VIGOROUS is the key word. Turn on some dance music and keep moving so your heart-rate stays elevated. If you can sing with ease, you aren’t working hard enough! Look for ways to make things harder, not easier. Remember to give equal attention to BOTH arms (switch arms while vacuuming!) and both legs. Add in some lunges. Before know it you will have worked all parts of your body, burned just as many calories as you would at the gym and the added bonus will be a nice clean house. Just as with any other workout, make sure you drink plenty of water before, during and after your housecleaning. Don’t forget to stretch when you all done. Take a few minutes to sit in meditation and be proud of a job well done. Maybe your house is clean but you lawn needs to be mowed, your garden needs to be tended to, or your car needs to be washed…Wherever you have to find your fitness, just do it! NO EXCUSES! Have a great Saturday. **I pretty much doubled everything, though you really don’t have to worry about precise measurements. Last night I had enough mixture and potatoes to make 2 casseroles. One gotten eaten and the other got split and taken home as leftovers. The kids said this dish was “off the chain.” I believe that’s a compliment 🙂 Served with a big salad, grainy bread, grilled seasonal vegetables and black bean, avocado, mango salad, our “back to school” dinner was the celebration I hoped for. As a bonus, Derek informed us that his company is reimbursing him for his tuition. That was great news for Mitch and I who offered to pay for his schooling because “the more you know, the more you grow.” I guess his company believes in that, too! About a week ago I closed a blog with a line about milk and promised more to come. So here’s more! OF ALL THE ANIMALS ON THE PLANET EARTH, HUMANS ARE THE ONLY ONES THAT DRINK THE MILK OF OTHER ANIMALS. Think about that. Turns out there is much bigger concern for milk drinkers than just a little gas. One study from the Department of Human Nutrition in Denmark, showed drinking lactose leads to a high insulin response which can make us sluggish, bloated and at greater risk for diabetes. Other studies from here in the states as well as abroad link milk to autoimmune disorders such as Crohn’s disease and rheumatoid arthritis. One nutrition expert, Pedro Bastos, suggests it may be the ingesting of foreign hormones that triggers the inflammation in humans. He also points out that calcium is more readily absorbed from vegetables in the Brassica family (new word for me!) – broccoli and cabbage, to name a couple. An easy rule of thumb in picking vegetables high in calcium is “the darker green, the better.” Spinach, broccoli rabe, kale, swiss chard, collard greens–all high in READILY ABSORBABLE calcium. With all this said, IF you are an athlete, IF you have NO problems digesting milk and you don’t drink enough of it to be concerned with calcium leakage, or digesting the sugar, etc., it DOES make for a good post-workout drink as it is high in protein and very affordable (compared with protein drinks). From a health standpoint, I don’t love bringing this up-but from a fitness standpoint, I feel it’s only fair I do. When Kyle lived home and did P90x, a glass of milk after his workout was a perfect protein boost for him. As an FYI, soymilk provides about the same amount of protein as cow’s milk. I stand firm that we don’t need (or shouldn’t even have) much of the protein we have been duped into thinking we need to build stong muscles and bones. Next month will mark 6 months since switched to an ALL plant-based diet and I haven’t seen any loss of muscle. I will be planning on getting some blood work done before the year is over, just to make sure all my numbers are in order. One thing I know for sure, without any blood work or doctor visits is that physically, mentally and spiritually, I finally feel completely connected. 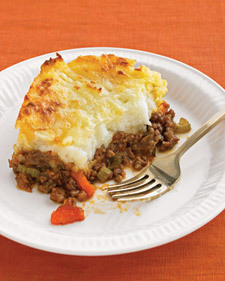 Tonight’s VFT dinner theme is “Back to School.” That just means I will be making a hearty meal, Pete’s favorite–Sheppard’s Pie-a recipe I got out a book called Quantum Wellness. I will share that recipes, tomorrow. Though it’s not my favorite, it’s easy to prepare in advance –makes a great dish for a holiday table or a cold night or anytime comfort food seems in order. It is one of the dishes I make for special celebrations. I am really proud of the Thursday night “kids” for their ability to juggle work, school, their music business, social lives, and so much more. They deserve to celebrate…and be celebrated. Thanks again to the people at Men’s Journal for a great read on cow’s milk. Thanks also to my students who shower me with fresh fruit from their yards!!! As I mentioned yesterday, I am pretty sure love means bringing your vegan instructor the fruits of your labor! From mangos to avocados and gorgeous limes, my fruit bowl runneth over. Thinking a mango black bean salad with fresh lime juice and cilantro is going on the table tonight. YUM. Have a great day. Make wise choices. Celebrate you. Posted on August 26, 2010 August 26, 2010 Categories Food, Holidays and celebrations, vegan thursday5 Comments on Got Milk? What’s new in fitness, you ask. Mostly the same old, same old. Ballet type classes are pretty hot, but not as hot as they were expected to be, in my humble opinion. One thing that remains trendy is anything that creates instability. From balls to balance boards, fitness experts seem to agree that anything that creates instability provides a better full-body workout. Once attached to the ceiling, along with push-ups and squats, one can also do dips, flies, pull-ups, crunches, pike position and much more. To better visualize how you would use these, here’s another picture of someone in action. Though I am NOT rushing out to buy one of these, I think they would be great for athletes and can imagine all the Pilates based exercises that can be done at a fraction of the cost of Pilates machines. I can certainly see these in a small personal training studio. Not sure I’ll have a chance to try them in the near future, but I know from Pilates work how challenging and beneficial the straps can be. New straps to get you ripped. That’s what’s new in the fitness arena. Personally, I will stick with same old same old, for now. This summer I am just LOVING swimming and that’s about as old as old can be. Posted on August 25, 2010 August 25, 2010 Categories Fitness1 Comment on Feeling Strapped? My mom taught me the importance of exercise, not just by example, but also by helping me get started in this field 29 years ago. My mom was ALWAYS trying to lose that last 5 pounds. She tried every diet under the sun and was always on one or another. Most everyone of those diets have been around the block and back, more than a few times. We are ALL trying so hard to find that magic bullet, but I have always contended that counting calories, doing regular exercise and drinking lots of water are the key ingredients to a healthy weight. Why people have such a hard time with the water is beyond my imagination. It’s cheap, (often free depending where you live) readily available, abundant, easy to transport and at least here in sunny south Florida, quite refreshing! As a long time advocate of water, I was really happy to see the news report this morning, confirming that simply drinking 2 glasses before each meal helps us to lose weight. Seems so simple, right? For the most part, I think most of us really already know this. Common sense would tell you after 2 glasses of water you would already been starting to fill up. So scientists from Virgina tested the theory on 48 adults and split them into 2 groups. For 12 weeks each group consumed a low-calorie diet, one group drinking the 2 glasses of water before the meal, the other group, no water. At the end of the 12 weeks, the group who drank water lost an extra 5 pounds over the non-drinking group. The water drinkers consumed about 75-90 fewer calories at each meal. For many of us, I believe those 250-300 calories are exactly what are keeping us from losing that last 5 pounds. Additionally, I would think that by drinking the 2 glasses before each meal, it would make it hard to be thirsty for the sweetened stuff. Sugar and sugar substitutes are hurting us in more ways than just thickening our waist line, so filling up on water seems to make a lot of sense. Always has. Everything old is new again. Water, its the new “diet supplement.” Safe and effective, if you are struggling with weight loss, this seems like a simple experiment to try yourself. Some worry that too much water will deplete their salt and electrolytes. Unless you are running a marathon, or working outdoors all day in the 100 degree weather, you probably don’t have to worry about this. For the past 29 years I have been working out several hours a day, often in the outdoors, and plain old water has been just fine for my hydration needs. Additonally, eating fresh fruits and vegetables, is a great aid to healthy hydration. I don’t know about you, but even though I already drink a lot of water, I will be trying this experiment. Definitely can’t hurt and for those of us that have a hard time squeezing in 8 glasses a day, this would take care of 6 of them! Saw Eat, Pray, Love yesterday and it might have been even better than the book. The messages about love, life and balance are fabulous. If you read the book, or if you didn’t, I highly recommend this film. I also recommend the follow up book, Committed and I thank my friend, Christine for basically forcing me to read both and for coming to see the film with me. Ironically, while I loved India in the book, Christine loved Italy–Yet when we saw the film we both agreed Bali had it all over both of those other places. Talk about some peace! Prior to the movie, I watched Sunday House Calls with Dr. Rosenfeld. Amongst many other topics, he discussed the correlation between calcium supplements and heart disease in older women. While one would wonder what the correlation could possibly be, the good doctor explained how the supplements don’t break down as well as the real thing, possibly causing them to build up in the system. In fact, googling this just this morning, one study showed a 31% increase in heart attacks in the group of woman taking the supplement (vs. the placebo). I am finding the best place to get calcium that is readily absorbed into our bones is the leafy greens. This is why I made rapini (broccoli rabe) with dinner last night. This can be bitter, so I tried a recipe that called for it to be tossed with olive oil and baked in the oven at 350 for 35-40 minutes. It was ok. The little broccoli heads were soft and sweet, but the leaves were a bit stringy and hard to chew. Next time, I would take off more of the leaves BUT not all–I am guessing much of the calcium and other nutrients are in those leaves. Those other nutrients, by the way, include Vitamins A and C, folic acid, iron, magnesium, potassium, zinc and fiber. As it is part of the crucifer family, it is also a cancer-fighter! NO WAY we are getting all that from ANY supplement! Here in Broward County, Florida it is BACK TO SCHOOL DAY. Good luck to all my educator friends as well as the many in my life who return to school this week. From my little boyfriend, Nate, who starts a new year of pre-school to Nicole, Derek and his friends and my friend’s kids, some in the throws of getting degrees, some just returning after years of hiatus and some just dabbling, the education road is a great road to be on! Congratulations to Sylna on another wonderful book club get together this past Saturday. It is always wonderful to hear how much fun you all have and how bonded you have become! Brain fitness is every bit as important as body fitness. Book club, however, is so much more than JUST brain fitness! I’ll look forward to hearing more about this at SilverSneakers class, later this morning. Sylna, YOU rock, my friend! It’s time for me to get ready for work, but in closing I encourage you all to keep reading and keep learning. Be it about life, love, health, history or algebra, one thing remains the same. The more we know, the more we grow.